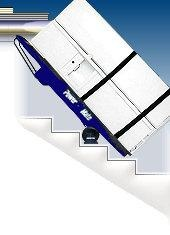 Stairclimbing HandTruck Manufacturer: L P International Inc.
L P International Inc. has been in business under the same ownership since 1976 manufacturing and selling thousands of PowerMate Safety Moving Systems worldwide. The company has achieved an excellent reputation for supplying the highest quality products (including many components made in the USA) as well as providing superior operator training and customer service. In 2002, the company moved into a new 35,000 sq. ft plant with extra land for future expansion in the newly developed industrial park in the NW section of Brantford, Ontario. The company currently employs 35 full time employees. 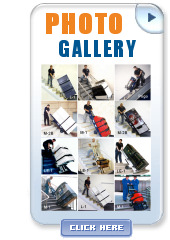 L P International Inc. has developed a wide variety of Lifting Products including the top selling PowerMate line of motorized electric stair climbing handtrucks. The company has developed the world's first interior tailgate lift called the LiftGate. The company also makes specialty powered handtrucks. The company's engineering department uses state of the art modeling software in the ongoing development of new products and accessories. People make the difference ..
Our PowerMate® line of stair climbing hand trucks are recognized around the world for quality construction, durability and versatility. Our dedicated staff work hard to bring you, our customer, the best quality product available in the industry. Take a moment to look through our website. If you have any questions a Solution Specialist will be happy to help you! visit our plant at 151 Savannah Oaks Drive, Brantford, Ontario, Canada. Let's Talk About What We Can Do For You ..